Florida Laws About Cell Phone Use While Driving | DeLoach, Hofstra & Cavonis, P.A. Is it illegal to text while driving in Florida? Electronic devices are one of the largest distractions for drivers in the U.S. On average, the time it takes to glance at a text message or see who's calling is enough for a driver to travel nearly 300 feet—enough to strike a pedestrian, hit the back of a stopped line of cars, or even veer off the road entirely. Many states have laws to curb the distracted driving epidemic, including making cell phone use illegal behind the wheel. Cell phones. There are no laws prohibiting drivers of passenger cars in Florida from talking on cell phones while driving. Throughout the state, it's completely legal for drivers can make and answer calls, use handheld devices, or use the integrated hands-free system in their cars. Texting. While drivers are allowed to talk on their phones, they are expressly forbidden from texting, e-mailing, or instant messaging while driving. It's illegal for drivers in Florida to type anything into a virtual keyboard, or even use hit a button on a device to send or read messages. Although texting and driving is illegal, the act of typing on an electronic device itself isn't enough grounds for arrest. A driver can only be pulled over and charged if he or she has been stopped for another traffic violation, such as running a red light. Depending on the violation, drivers caught while texting can face a number of fines and additional consequences. For instance, drivers caught texting in a school zone will have two points added to their licenses, while those whose texting resulted in a crash will have six points added to their licenses. Truckers and bus drivers. Operators of trucks and buses are held to a higher standard than other drivers. Both truck and bus drivers are only allowed to use wireless communication devices if they're hands-free, and can be pulled over and charged if they use a handheld electronic device while driving in Florida law without committing another violation. For the first violation, commercial drivers can a fine up to $500 and their companies can be charged separate costs up to $2,750 fine. If a driver commits three texting violations or more, he or she can be liable for a $2,750 fine and license suspension for 120 days, while the employer can be fined up to $11,000. It's important to note that there are a number of exceptions to Florida’s cell phone and texting laws. For instance, drivers can send text from a vehicle that's stationary or not in operation. There are also some exemptions for operators of emergency vehicles, law enforcement vehicles, or fire engines, as long as messages are sent for professional reasons in the line of duty, such as reporting an emergency or suspected crime. The law also exempts a driver operating an autonomous vehicle, as long as the vehicle is in autonomous mode for the entire time the driver is messaging. If you've been injured in a distracted driving accident, you should have the incident investigated as soon as possible. 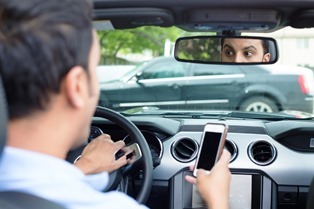 A thorough examination can reveal if a driver was using his or her cell phone at the time of the accident, which can significantly affect the amount of damages a victim can be awarded. Our attorneys can help you build a strong injury case and advise you of all of your legal options. Simply fill out the form on this page today to make an appointment in our offices, or call the number on this page to speak to an attorney.